Danish second division club Herfølge Boldklub yesterday announced on its official website that Herfølge Boldklub playmaker and Danish youth international Nikola Saric (17) will join English Premier League club Liverpool this summer. After a test at the Barcelona youth academy three years ago, Barcelona offered Saric a contract. 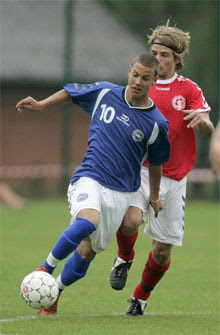 Back then the player was only 14 years old and his family thought it was better for him to develop further in Denmark. It is unclear if Barcelona was still interested in signing Saric. Reports claim that several European top clubs have been in the race for the attacker with Serbian roots over the last months. Herfølge Boldklub sports director Per Rud says that he travelled around Europe since the beginning of the year to hold talks on the player but that things rarely became concrete. Danish newspaper Dagbladet Køge thinks that Liverpool will pay between 400 000 and 700 000° euro for Saric, whose contract with Herfølge Boldklub expired at the end of this year. All advertising benefits from this blog go to a children's project in Africa and a world-wide cultural heritage project. Every visit, every click helps. Euro 2008: Should we support Spain? New players for a new system? This blog doesn't own some of the images published. If you own the image, please contact me to acknowledge you or so I can delete the image if you don't want it on this blog.